Roast cod, for when local cod appears at the fish market — Smothered in a mix of late-season tomatoes, garlic, and last of the basil, and oven-roasted over a bed of potatoes pan-fried in good olive oil. Leftovers are turned into a crusty skillet hash, and topped with a fried egg to give us enough energy to turn back the clocks. Local ingredients: Cod from Seaport Fish; tomatoes from New Roots Farm; Yukon Gold potatoes, garlic, and basil from the garden. 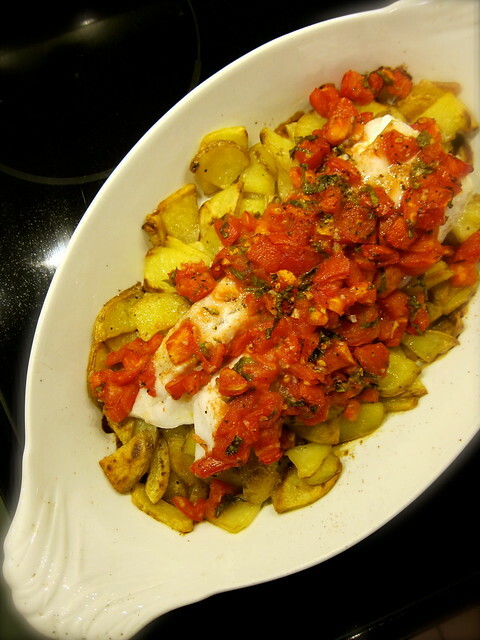 This entry was posted in cooking and tagged cod, fish, garlic, potatoes, seafood, tomatoes. Bookmark the permalink. One of our favorite ways to prepare cod, really easy and all in one dish! I am going to bookmark this recipe. We have locally caught cod and tomato season is not yet totally over. This dish sounds just perfect for dinner. If I remember correctly, it’s based on a Ligurian dish!